I have some elder HDDs that I want to sell on eBay. One of them is an external CnMemory HDD (USB 2.0) - internally a Hitachi HDS721010KLA330 working internally. 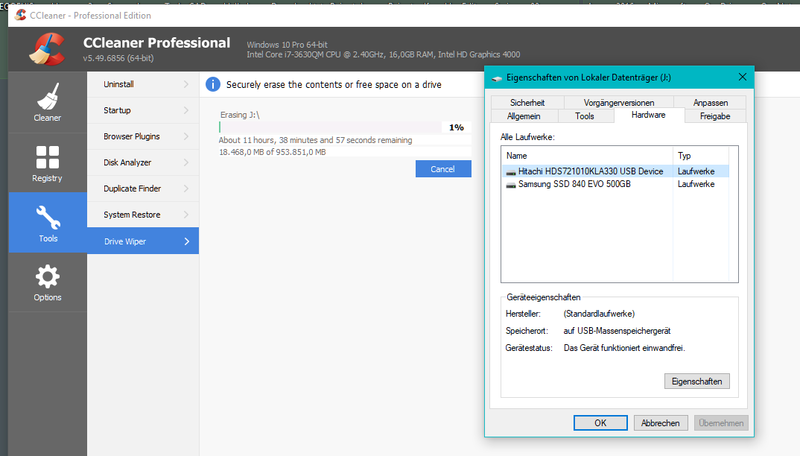 My main Win 10 drive is a Samsung SSD EVO 500GB. I want to wipe the external drives before sending them out. Thus, I tried to select a more secure (multi-pass) wipe algorithm. This is not possible. CC Cleaner tells me that my Hitachi drive is an SDD drive, too! This isn't the case! Can I do anything to let CC recognize the HDD correctly? This is a long, long running bug in the program. no official word on any sort of resolution. Weirdly, the issue for me at least tends to come and go depending on the version so you could try a few older versions and see if you get lucky. old versions available from Filehippo. or just do an old fashioned low level format on that drive.